I spent all of January studying perspective. I go back to basics the beginning of every year. There were definitely many, many things I didn’t understand. I understood perspective intellectually, but I wasn’t able to utilize that knowledge, I had to think too long, my lines were too messy, curves confused me to no end, I couldn’t really create space or volume… which means I didn’t really get it. Perspective is not just about theory, in fact understanding perspective means completely forgetting about the theory and being able to construct and build things while being focused on design, not on where each line should go. This is developed through practice. Through exercising basic fundamentals until they are completely internalized and you are operating on automatic. This, again, is a function of your brain. So after a month of studying and practicing, I was still having trouble with cars, the intersection of the glass area and the body particularly confused me. 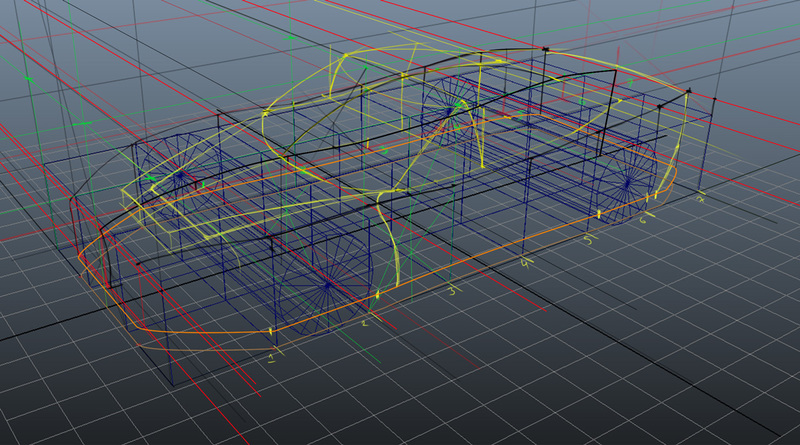 So I decided to set myself a challenge – to construct a car in perspective and to render it fully in 5 days. You can find the finished challenge, along with a huge tutorial of how it was all done here.